The Brentinae, the primitive weevils, is a relatively small, primarily tropical group represented in the eastern United States by only four species, three of which are restricted to extreme southern Florida. The fourth species, Arrhenodes minutus (Drury), ranges from Florida north to Canada and is sometimes an economic pest of oaks. The family recently has been redefined (e.g., Anderson 1992) and now includes several other groups formerly treated as separate families or included in the Curculionidae. The species treated here all belong to the subfamily Brentinae and comments refer to the members of that subfamily only. Primitive weevils are usually extremely elongate with straight snouts and non-elbowed antennae. Adults are usually medium-sized beetles, with one Florida species attaining a length of more than 50 mm, and often exhibit striking sexual dimorphism. Larvae possess legs, unlike most other weevil larvae, and are very elongate. The only eastern U.S. species whose larva has been described is Arrhenodes minutus (Drury). All four Florida species belong to different tribes and different genera. Warner (1960) and Arnett (1973) provide keys to the US genera. Distribution records were compiled from Anderson (1992), Peck and Thomas (1998), and specimens in the Florida State Collection of Arthropods. The oak timberworm, Arrhenodes minutus (Drury), is 13 to 35 mm in length. Its color is red-brown with yellow markings on the elytra. Males and females are strikingly different. Figure 1. Adult male oak timberworm, Arrhenodes minutus (Drury), a primitive weevil. Photograph by Lyle J. Buss, University of Florida. Figure 2. Adult female oak timberworm, Arrhenodes minutus (Drury), a primitive weevil. Photograph by Lyle J. Buss, University of Florida. Figure 3. 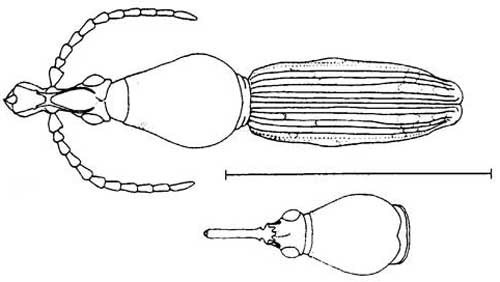 Adult Arrhenodes minutus (Drury), a primitive weevil. Image shows male (top) habitus (general form and appearance), female (bottom) head and prothorax. Line represents 10 mm. Illustration by Division of Plant Industry. This is the only species for which detailed biological information is available. Not coincidentally, this species is an economic pest of oaks in the eastern U.S. It infests oaks, especially black and scarlet oaks, elm, poplar, beech, and aspen. "Economically damaging losses are primarily to standing timber grown for wood products ... losses result from the small worm holes made by feeding larvae" (Solomon 1995). Beetles are attracted to wounds on living trees and oviposit only on exposed wood; up to 78 percent of wounded trees in one study were attacked (Buchanan 1960). Figure 4. 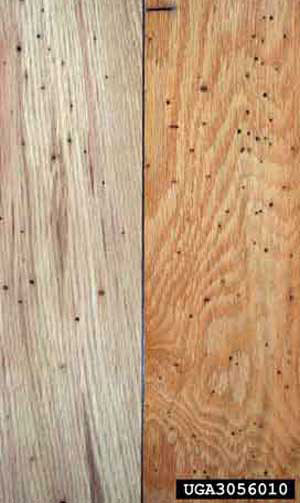 Damage (holes) caused by oak timberworm, Arrhenodes minutus (Drury), a primitive weevil. Photograph by James, Solomon, USDA Forest Service; www.forestryimages.org. Life cycle requires three years for most individuals, but development time ranged from two to four years (Buchanan 1960). Males are territorial and guard females during egg-laying. Battles between males sometimes last 10 minutes or more, with the victor assuming the job of guarding the female (Sanborne 1983). Riley (1874) reported that the male helped the female remove her beak if stuck in the wood while drilling an egg hole by "stationing himself at a right angle with her body and pressing his heavy prosternum against the tip of her abdomen, her stout fore legs thus serving as a fulcrum and her long body as a lever." This is one of very few instances of tool use by insects. However, Sanborne (1983) did not observe this behavior. 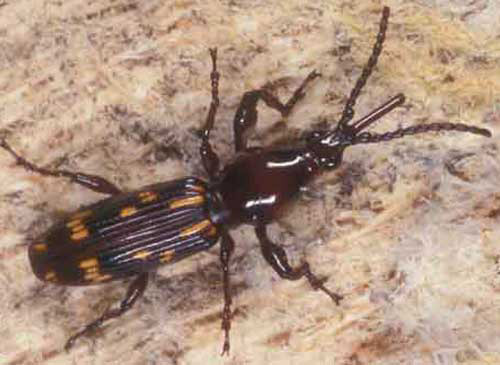 These beetles also serve as vectors for oak wilt fungus, Ceratocystis fagacearum (Bretz) Hunt (Solomon 1995). This species ranges from southeastern Canada, throughout the eastern U.S. to Florida and west to Texas (Peck and Thomas 1998). Specific Florida county localities are: Alachua Co.: Gainesville; Columbia Co.: Lake City; DeSoto Co.: 1 mile west of Brownville; Dixie Co.: 3.5 miles north of Old Town, Pine Landing; Gadsden Co.: Hardaway; Lake Co.: Clermont; Leon Co.: Tall Timbers Research Station; Okaloosa Co.: Ft. Walton Beach, Shalimar; Orange Co.: Windermere; Polk Co.: Lake Garfield. Adults have been collected in Florida from February through November. It also occurs in areas of Dixie, Highlands, Jackson, Levy, Liberty, Orange, Union and Walton counties (Peck and Thomas 1998). Brentus anchorago Linell is 15 to 52 mm in length. Its color is black with longitudinal yellow marking on the elytra. Males and females are strikingly different. It seems to be primarily associated with gumbo-limbo, Bursera simaruba L. (Sarg. ), throughout its range. Larvae bore in dead wood and adults sometimes occur in large numbers under the bark of dead logs. This widespread Neotropical species is known from Mexico, the West Indies and South America. (Peck and Thomas 1998). In the U.S. it occurs in Dade and Monroe counties in Florida. Specific Florida county localities are: Dade Co.: Miami, Matheson Hammock, Castellow Hammock, Royal Palm Hammock (Everglades National Park); Monroe Co.: Key Largo, Elliot's Key, Islamorado, Key West. Figure 5. 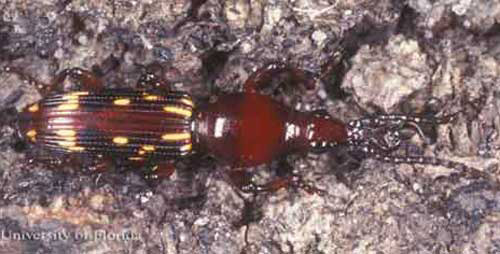 Adult Brentus anchorago Linell, a primitive weevil. Image shows male (top) habitus (general form and appearance), female (bottom) head and prothorax. Line represents 10 mm. Illustration by Division of Plant Industry. Paratrachelizus uncimanus (Boheman) is 11 to 20 mm in length. Its color is reddish-brown, with the legs darker. There is sexual dimorphism exhibited in the beak and elytral apices. But it is not as dramatic as that exhibited by B. anchorago. A female is shown below. In the male the apex of the rostrum is expanded laterally and the eytral apices are prolonged. Two specimens were collected feeding on the fruits of Solanum erianthum D. Don (Anderson 1992). Figure 6. Adult Paratrachelizus uncimanus (Boheman), a primitive weevil. Image shows female habitis (general form and appearance). Line represents 1 mm. Illustration by Division of Plant Industry. This species has been recorded from Cuba and the West Indies. In the U.S., it apparently occurs only in the Keys in Florida. The author has seen specimens from Key Largo, and Anderson (1992) recorded specimens from Big Pine Key and Elliot's Key. It has been collected at light and in flight-intercept traps. There are two specimens in the Florida State Collection of Arthropods collected on Flaveria linearis Lag., a native composite, and one on Thuja sp., an exotic gymnosperm. Stereodermus exilis Suffian is 5 to 7 mm in length. It is brown in color without markings. Sexual dimorphism is not present. Figure 7. Adult Stereodermus exilis Suffian, a primitive weevil. Image shows habitus (general form and appearance). Line represents 1 mm. Illustration by Division of Plant Industry. All the specimens the author has seen of this rarely collected species were collected at light. Anderson (1992) also recorded specimens taken in flight-intercept traps and in Berlese samples of leaf litter from hardwood hammocks. Nothing is known of its biology or immature stages. It occurs also in the West Indies (Anderson 1992). Warner (1960) first recorded it from Florida based on specimens from Key West. Other Florida county localities include: Dade Co.: Camp Mahachee; Monroe Co.: Key Largo, Long Key State Recreation Area, Stock Island. Anderson R. 1992. Curculionoidea of southern Florida: An annotated checklist (Coleoptera: Curculionoidea [excluding Curculionidae: Scolytinae, Platypodinae]). Insecta Mundi 6: 193-248. Arnett RH Jr. 1973. The beetles of the United States. American Entomological Institute. Ann Arbor, Mich. 1112 pp. Buchanan WD. 1960. Biology of the oak timberworm, Arrhenodes minutus. Journal of Economic Entomology 53: 510-513. Blatchley WS, Leng CW. 1916. Rhynchophora or weevils of north eastern America. The Nature Publishing Co., Indianapolis. 682 pp. Peck SB. Thomas MC. (1998). Family Brentidae: the straight-snouted weevils. A distributional checklist of the beetles (Coleoptera) of Florida. http://entomology.ifas.ufl.edu/brentid.htm (5 June 2006). Riley CV. 1874. The northern brenthian - Eupsalis minutus (Drury). (Ord. Coleoptera; Fam. Brenthidae). Sixth Annual Report on the Noxious, Beneficial, and Other Insects, of the State of Missouri. Began and Carter. Jefferson City. 169 pp. Sanborne M. 1983. Some observations on the behaviour of Arrhenodes minutus (Drury) (Coleoptera: Brentidae). The Coleopterists Bulletin 37: 106-113. Solomon JD. 1995. Guide to insect borers in North American broadleaf trees and shrubs. U.S. Department of Agriculture Forest Service. Washington, D.C. Agriculture Handbook AH-706. 735 pp. Warner RE. 1960. The genus Stereodermus new to America north of Mexico with a revised key to the genera of Brentidae. The Coleopterists Bulletin 14: 29. Author: Michael C. Thomas, Florida Department of Agriculture and Consumer Services, Division of Plant Industry. Originally published as DPI Entomology Circular 375. Distribution updated for this publication.